Project opportunities for the summer of 2016 are all described below on this page. The table below summarizes these opportunities. The importance of corrosion protection can hardly be understated. Virtually all metal objects corrode to some extent. Technological solutions vary between promoting certain kinds of corrosion (bluing) to completely covering the metal surface to prevent interaction with the atmosphere (painting, etc.). Concern about corrosion is particularly important in biomechanical situations, where materials are placed inside the human body. There is a very limited list of materials that can be used for implants, primarily due toxicology concerns. In these cases, it is desirable for at least the surface of the implant to mimic the chemistry of the body to some extent. This is one important place where organic thin films can be used. Thin polymer films can be produced by simple plasma techniques that do afford at least some corrosion protection. When a moderate voltage (several hundred volts) is applied between two metallic plates in a low-pressure monomer gas, the gas is ionized and begins to glow (like a fluorescent light bulb), and a polymer film grows on the plates. This process, illustrated in figure 1, can be accomplished in a rather compact vacuum systemlocated in Olin Hall. A number of students have worked with me to put together this system, and weare now able to produce films quickly and in a repeatable manner. Figure 1. Plasma technique. Low pressure monomer gas is excited by high voltage producing ions and free radicals which are attracted to plates where they form a thin film. During recent years, I have worked with several students to systematically study how the plasma produced films grew. Our goal was to grow films of varying (but repeatable) thickness from very thin to very thick and use the scanning tunneling microscope to measure their nominal thickness and how well the surface is covered. We hoped to be able to determine if the films formed first in clumps or islands, increasing in size until they overlap, covering the surface, or if they are uniform even when very thin. We are continuing to make increasingly thinner films, a task which is somewhat challenging due to the short time necessary to grow the films. We have produced films with nominal thickness less than 500 angstroms and have yet to see anything but uniform films. It is possible, indeed likely, that we won’t be able to observe and non-uniformity until we make films that are around 100 angstroms or thinner. Determining the composition and morphology of these films is a major part of this project. In the past, we have used infrared spectroscopy (FTIR, to be specific) to determine composition and to get a rough idea of thickness. We have attempted to use scanning tunneling microscopy (STM) to study the film surface and thickness, but have been challenged by the fact that the films are good insulators. We plan to augment the STM measurements with atomic force microscopy (AFM) which works well on insulators as well as conductors. After getting some understanding of how these polymer films form, I would like to expand this research to include films produced in a radio frequency plasma It would also be interesting to perform corrosion testing on samples produced by all of the techniques to “close the loop” of inquiry concerning the corrosion protection. This would entail the construction and/or purchase of a high humidity chamber and would require additional funding from outside sources. In my laboratory, we are seeking to understand at a molecular level how genes are regulated through degradation of messenger ribonucleic acid (mRNA) molecules. mRNA molecules are copies of genetic information stored in the corresponding chromosomal DNA and are used by ribosomes to direct the synthesis of proteins. Changes in mRNA abundance usually alter the amount of the corresponding protein, so processes that alter mRNA levels such as degradation are important for regulating gene expression. Fidelity in gene regulation is necessary for proper cell growth and development: mis-regulation is the basis for a number of genetic diseases and cancers in humans. Deepening our understanding of the molecular mechanisms for mRNA degradation is important for evaluating the potential causes of clinical diseases and for improving human health. Using bakers' yeast as a model system, we study two specialized mRNA degradation pathways, nonsense-mediated mRNA decay (NMD) and exosome-mediated mRNA decay (EMD). We are interested in identifying and studying mRNAs degraded by NMD and EMD to determine the molecular features that are responsible for their recognition. We have determined that both NMD and EMD affect the expression of CTF13, a gene that encodes an essential centromere protein. NMD accelerates the degradation of, and so has a direct effect upon, CTF13 mRNA. In contrast, EMD indirectly affects CTF13 expression, most probably through degradation of an intermediate mRNA, perhaps that of a transcription factor for CTF13. The project currently available in my lab aims tovverify the basis for genetic interactions we have observed between CTF13 and three other centromere-related genes and will involve genetic and molecular techniques. Course prerequisites: One semester college laboratory science course recommended. Minnesota has a statewide fish consumption advisory due to mercury contamination. The goal of this multi-investigator study is to identify why some of the rivers in Minnesota have particularly high levels of Hg in fish. Five rivers in northeastern and northwestern were chosen as study sites and sampling beganlast summer. The Jeremiason Lab is part of a group attempting to better understand how hydrologic dynamics in the rivers impact the conversion of inorganic mercury to methylmercury, themore toxic form of mercury that accumulates in fish. The Jeremiason Lab will be analyzing water and sediment samples for mercury and collecting samples during the summer months. Understanding the mercury cycle in these complex systems requires landscape and food web characterization, knowledge of hydrology, soil and water chemistry, photochemistry, etc. Students will have the opportunity to interface with graduate students, other professors, and state scientists working on the project. Students working on this interdisciplinary project would participate in rugged field work, learn field sampling and quantification techniques for mercury while processing many samples, and learn to operate and maintain several scientific instruments for the analysis of the different forms of mercury. Although once a keystone herbivore numbering in the millions on the Great Plains, most American bison now are kept and intensively managed on small reserves. Managers are often aware of the need to conserve genetic diversity, but less often are they aware of the value of maintaining behavioral diversity as well. This project will take place on one such reserve, the 8000 acre Ordway Prairie reserve of the Nature Conservancy in South Dakota, and seeks to characterize the value of bison behavior to genetic diversity. You will work as part of a team of three to five student researchers, contributing to the overall project goals as well as undertaking your own research project. 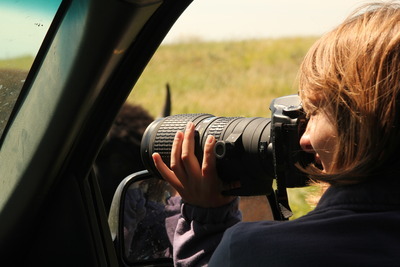 The project runs from June to mid-August for 10 weeks, and includes 6-7 weeks of intense bison behavioral observation that will require learning to identify 15 or so individual bulls from natural markings, then recording their interaction, bellowing and mating behaviors over the course of the summer breeding season. In addition, you may be asked to help out with reserve management duties as well (e.g. fence repair, weed control,maintenance activities). You will be supervised by both myself and the reserve manager at Ordway. Ordway Prairie is in the rolling prairie pothole region of South Dakota, 10 miles west of Leola (popln 300) and 45 minutes NW of Aberdeen (the nearest city). Successful applicants willhave interests in animals and conservation, have good observation skills, be in good physical condition, and be able totolerate living in an isolated setting with few companions. Skills at taking good notes, using GPS receivers, experience with ATVs, and some mechanical aptitude are pluses. Housing provided on site. The separation and analysis of complex mixtures is a continuing field of development that has applications in environmental and food regulation, the chemical industry, and forensic analysis. The current state-of-the-art equipment for analyzing complex samples is a two-dimensional liquid chromatograph with mass spectrometric detection. This technique uses two separation columns with different properties to “break up” a complex mixture into individual components prior to analysis. However, many mixtures contain components that are too similar to achieve an adequate separation in one column and/or inadequate physiochemical properties to interact with a different column. This project aims to continue developing another dimension to this separation by chemically converting the components off one column prior to entering the second using a heterogeneous catalyst, essentially changing the physiochemical properties of the analyte to interact better with a second column. This technique will be applied to the analysis of lipid content in oils and fruit extracts. This work will require a proof-of-concept combination of two well-studied techniques: separation and analysis of complex reaction mixtures using high performance liquid chromatography and the liquid-phase hydrogenation of unsaturated organic compounds with a platinum catalyst supported on inorganic oxide supports. The student will be performing benchtop hydrogenations using the platinum catalysts under a variety of reaction conditions (temperatures, concentrations, adding hydrogen-transfer reagents, pH, etc.) to optimize reaction conditions to achieve rapid and complete hydrogenations. The student will also have the opportunity to transfer this knowledge in setting up an in-line reactor before a chromatography column with potential to install the reactor between the first and second columns of a two-dimensional liquid chromatograph. The experience of optimizing a reaction system on a bench-scale and applying that knowledge in achieving better analytical separations is a valuable experience for a student looking at a future in a chemistry-related field. My research in environmental physiology focuses on the adaptations of insects for winter survival. Characteristics of the winter environment such as low temperature and decrease in water availability impose manifold constraints on survival of cold-blooded, or ectothermic, animals. These stresses have, in turn, collectively shaped diverse strategies of these animals – evasion or tolerance of freezing temperatures, mechanisms of energy conservation, and resistance or tolerance to dehydration – through the process of natural selection. In order to better understand the basis for these adaptations, my research program employs a broad range of approaches from cutting-edge molecular techniques to classical, whole-organism studies. This summer, we will be examining the effects of rapid-cold hardening (RCH) on the metabolic activity of insects. The RCH response describes the ability of insects to swiftly adjust their physiological states to changing environmental conditions. Not only does it extend the limit of low-temperature survival, but it also functions to promote the maintenance of various physiological and behavioral processes in the face of environmental disturbances. Previous studies have suggested that this response likely requires energetic investments in the form of ATP to be elicited. Does RCH simultaneously function to maintain the metabolic activity of insects to supply those ATP? This is the fundamental question underlying this project; students will become familiar with the fundamentals of experimental design, some physiological and biochemical laboratory techniques, and potentially the use of a fluorescent microscope. Students interested in this project should visit here to make a reservation for meeting. Whether overexpression of kinetochore proteins, as commonly observed in cancer cells, causes increased chromosome loss? Whether changes in kinetochore position make cells particularly resistant or sensitive to commonly used chemotherapy drugs? Whether alterations in kinetochore size or position accelerate the development of antimicrobial and/or chemotherapy drug resistance? A student would be able to choose from any of these three project areas and would learn a combination of molecular biology, microbiology, genetics, and/or cell biology techniques as well as gain practice in experimental design and data analysis methods. I am seeking a first-year student to join me in conducting water quality monitoring in the Seven Mile Creek (SMC) watershed near St. Peter. We are launching what we expect will be a long-term environmental observatory to study the connection between food production, land-use and water quality. The context of this work is that the Minnesota River, a major tributary of the upper Mississippi River, is impaired for (polluted by) nitrate, turbidity and other water quality parameters. Research is showing that the pollution is related to the ubiquitous row-crop agriculture in our area, which forms the foundation of the regional economy. Right now, over a million dollars is being spent to install pollution control strategies to improve SMC. In effect, this is a large-scale experiment to determine whether voluntary implementation of best practices and technologies can reduce sediment and nutrient pollution in a typical south-central Minnesota stream. However, no one is doing enough monitoring to really determine whether water quality is improving. This summer, we will begin that monitoring. Early on, you will learn how to operate sampling equipment and collect samples from streams. You will then learn laboratory techniques to measure water chemistry and pollutants. Throughout, you will learn geology, hydrology and environmental chemistry, and may work with ecologists and aquatic biologists. Also, you may learn some basics of GIS, and will certainly work closely with our partners at Nicollet County, the University of Minnesota, the Minnesota Pollution Control Agency and others. In short, this project is for someone who: enjoys learning new science; is excited about trying both field work and laboratory work; works well with people; and, is curious about Minnesota’s natural environment and agriculture. Also, the student must have a valid driver’s license and be willing to obtain college vehicle certification. Course Prerequisites: Students must have had at least one course with a lab in geology, biology, chemistry and/or physical geography. Each year Gustavus spends about 3 million dollars on energy, a figure that could climb as we renovate old building and construct new ones. But we may be able to keep energy costs under control while at the same time reducing the College’s carbon footprint simply by using less to accomplish the same tasks. Energy conservation is one of the four prongs of Gustavus’ energy plan, and in many peoples’ minds the first one that needs to be considered. We could install wind turbines, solar panels, and biomass generators to help produce the energy we use, but it makes a great deal of sense to control the consumption first so that we can size those items appropriately. Apart from Beck Hall, every building on campus was built at a time when there was very little concern for the amount of energy needed to run them. In order to obtain the LEED certification for that building, modern energy conservation techniques were employed in its construction. When Old Main was renovated, energy usage was a major consideration. But most other buildings on campus use substantially more than they need to or should. Determining how much more and devising ways to reduce energy consumption is the focus of this project. For many years the College has monitored the amount of electricity used by every building on campus and made the data available on its web site. Because of this and several energy initiatives, like the energy wars competition, building occupants have made some changes resulting in decreases in consumption. But these gains have been modest while even a quick look at the data shows a lot more potential. For example, Olin Hall of Science consumes a nearly constant 80 kW of electricity 24 hours a day, seven days a week with only occasional short decreases to 40 kW and increases to 120 kW. Even in the middle of the night when most of the equipment used by students and faculty is off, the power requirement is the same. If we could make a dent in that “base” load, we could make a large difference in the annual electricity bill for Olin, as well as the size of its carbon footprint. In most cases, there is a direct link between the amount of electricity need to run a building and its heating and cooling needs, so reduction in electricity may lead to reduction in heating fueled by natural gas. In order to study the details of how the electricity is used in building on campus, monitors will be installed on individual circuits inside the buildings allowing us to record their power requirements as a function of time. We should be able, for example, to determine how much power (and energy) is needed to run the elevator, or that which is associated to equipment plugged into outlets or hallway lighting. Recognizing where the energy is going will make it possible for us to design ways to reduce the consumption, save the College money, and help save the environment. The monitors will be installed by College electricians, but we will decide which circuits to monitor and for how long using building blueprints and other data. Data analysis will be done primarily in Excel and will involve straightforward mathematics. Initial modeling will also be done in Excel but may become more sophisticated as the project proceeds. Results will be in the form of recommendations to College officials on changes to each of the buildings studied. Since it is unlikely that all campus building will be studied during the summer, developing protocols for continuing studies in other buildings will also be an important outcome. Although there is good potential for wind energy in the Saint Peter area, Nicollet county regulations limit the installation of utility scales wind turbines to a few, mostly undesirable, locations. A new "wind delivery system" might allow the College to get around the regulations and give us the opportunity to generate electricity and reduce our greenhouse gas emissions. The system, designed by Daryoush Allaei at Sheerwind, Inc. brings wind down to ground level and speeds it up in a venturi where the energy is extracted by relatively small wind turbines, as shown in Figure 1. Because the INVELOX wind delivery system would allow the wind turbine to be located near the ground and fully contained in a structure, it may allow Gustavus to have an installation on campus with only minor permitting concerns. However, these systems are still more theory than reality. Dr. Allaei and colleagues at City College of New York have published a number of theoretical papers on the systems in peer-reviewed journals that include the results of simulations of energy production in a variety of wind climates. His company, Sheerwind (Chaska, MN), has only constructed small test systems and has limited data to support their claims. Seeing this as an opportunity to contribute to the database of information about the wind delivery system and increase our chances of getting a wind energy installation on campus, we are proposing to build a demonstration system which could be used by other students to continue research in this area. Figure 1. The INVELOX wind delivery system. We are proposing to design and construct an INVELOX system adjacent to the compost building, using 400 watt wind turbines from Menards to extract the energy. Since these use 44” diameter blades, the system can be kept relatively small, inexpensive, and less than 50’ tall, facilitating easy and cheap permitting. We plan to construct a wood support structure to hold an intake and tubes constructed from polycarbonate with the narrowest region being just slightly larger than 44” in diameter to house the turbines. To fully test the system, we would install three identical turbines separated by variable distances so that we can explore the relationship of separation to efficiency. The systems will be instrumented with anemometers at the intake and in key locations inside the tube and near the exhaust. Once constructed, research can begin in earnest with the collection of data on energy produced as a function of wind speed and direction. Our first system will be based on the design Sheerwind is preparing for construction in Royalton, but scaled down to better accommodate the 400 Watt turbines. Analysis of the results of data collection will inform necessary adjustments to the design which will improve efficiency. We will implement changes throughout the summer with the expectation that the system will be optimized by the end of 10 weeks, leaving it ready for other students to use for projects during the academic year. Liquid Chromatography is a separation technique with applications in areas ranging from drug discovery and environmental analysis, to neuroscience. Despite the fact that Liquid Chromatography was invented over 40 years ago in its modern form, it remains a very vibrant and exciting area of research. One particularly active area is the development of new technology to improve the performance of two-dimensional liquid chromatography (2D-LC). In the Stoll Laboratory we specialize in the development of 2D-LC, and are especially interested in and uniquely equipped to make advances in this area. In this project we will characterize a prototype of a new valve design that aims to improve the ability to detect low concentration compounds in a variety of sample types ranging from urine to plant extracts and pharmaceutical drug products. We will look deeply into the details of how fluids move into and out of the valve to understand the impacts of these fluid dynamics on the performance of separations of real samples. Students interested in engineering concepts and understanding how chemical instrumentation works will find this work particularly appealing. This project is a collaboration between the Stoll Group, a major instrument manufacturer, and the research group of Professor Sarah Rutan at Virginia Commonwealth University, who specializes in analysis of chromatographic data and modelling. Students interested in modelling, simulation, and computer programming will also find opportunities to build upon those interests in the context of this work.